The 2019 conference theme is 'The Innovative Geographer'. In an ever changing world, the study of Geography has become increasingly important. The technologies needed to collect, manage and represent our world are constantly changing. The proliferation of 'big data' and the everyday use of spatial technologies means that Geography teachers need to innovate in the classroom to ensure their students have the 21st century skills they will need to be successful beyond high school. Like and follow our Facebook Page, or follow us on Twitter(@agta2019) and Instagram (geoteachers2019) for conference updates. The 2019 AGTA conference program will provide opportunities for teachers from across Australia to share and reflect on their own innovations in the Geography classroom. The social activities, including Welcome Drinks, and the Conference Dinner will provide an ideal opportunity to network with fellow geographers from across the country. AGTA presents biennial awards to producers of materials used in the teaching of geography. >> For further enquiries please contact the Awards Convenors, Susan Caldis and Lorraine Chaffer at gta.admin@ptc.nsw.edu.au. Geography Fieldwork Unlocked features 34 inquiry-based fieldwork activities developed by a team of experienced Geography educators. Section 1 of the book introduces the reader to inquiry-based fieldwork. It provides guidance in developing fieldwork action plans, research methodologies, and data collection tools and approaches as well as guidance on the presentation and communication of fieldwork findings. Section 2 features nine fieldwork activities for primary students (Years F/K–6). Each of these activities has been designed to develop students’ conceptual understanding and the skills associated with inquiry-based learning. Section 3 showcases 25 fieldwork activities aligned to the topics studied by students in Years 7–10. Each fieldwork activity is framed by one or more inquiry questions. They also feature: a statement of expected learning; a list of the equipment needed to successfully complete each fieldwork activity; a short introduction; background information that contextualises student learning; pre-fieldwork activities; and detailed step-by-step instructions on how to complete each fieldwork task. 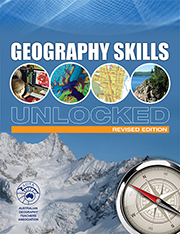 Geography Skills Unlocked (Revised Edition) is a skills book for Australian secondary schools. 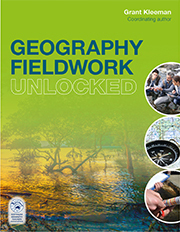 Geography Skills Unlocked is published by the Australian Geography Teachers Association and written by a team of experienced Geography teachers. >> Submit order — Please contact the GTA NSW office on 02 9716 0378 or via email at gta.admin@ptc.nsw.edu.au for orders of over 8 copies. Geography Literacy Unlocked has been written for secondary geography students seeking to improve their literacy skills. It includes a focus on written, visual and oral literacy. 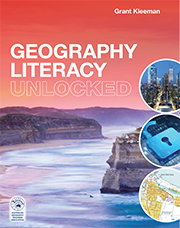 Geography Literacy Unlocked is published by the Australian Geography Teachers Association and written by Dr Grant Kleeman. One of Australia’s leading geography educators. Templates or scaffolds to support the interpretative skills students are expected to demonstrate. The GTA NSW's Primary Geography Alive website has been developed to support the implementation of the NSW Geography Syllabus for the Australian Curriculum in Primary years of schooling. 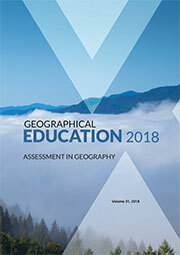 The Geography Teachers' Association of NSW Inc. (GTA NSW) commissioned a team of experienced Primary school teachers to deveop these exemplar units of work aligned to the K-6 requireemnts of the syllabus. Each unit consists of six to eight lessons complete with the resources required for their successful implementation in the classroom. GTAV eCourses provide online professional learning for trained and out-of-field Geography teachers. 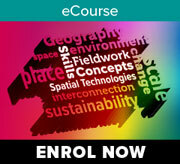 The latest Spatial Technologies module is now available. These eCourses are open to teachers from all state Affiliates. 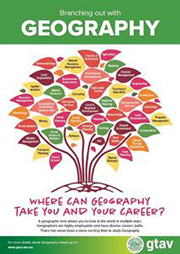 Designed for Year 8 – 10 students and their parents, this brochure outlines options that a study of Geography offers students including ideas about careers. 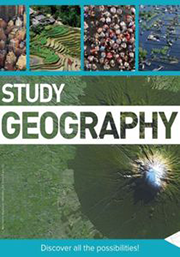 This is an essential resource for promoting a study of Geography in the junior and middle years. The Sampson Flat Bushfire Kit has been developed for SACE Stage 1 Natural Hazards unit. The kit focuses on mapping skill development, along with other geographical and inquiry skills through the exploration of a case study of the 2015 Sampson Flat bushfires. The TGTA was formed in 1968 in Hobart to further the promotion of geography teaching in Tasmanian schools and colleges. In 1993 the TGTA joined with the Geography Teachers Association of Victoria before being reformed in Tasmania in 2002. The 50th anniversary of the formation of the Tasmanian Geography Teachers Association is in 2018. 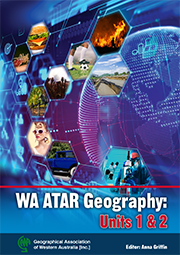 WA ATAR Geography: Units 1 & 2 has been written as a student textbook to address the geographical knowledge, understandings and skills of the Western Australian Geography Year 11 ATAR and Year 12 GENERAL geography courses that have been implemented in WA schools from 2015/16. This is a companion textbook to GAWA’s Year 12 textbook: WA ATAR Geography: Units 3 & 4 and follows the same format and structure. Geography: Shaping Australia’s future was prepared by the National Committee for Geographical Sciences and presents the state of play of geography as a discipline in Australia. 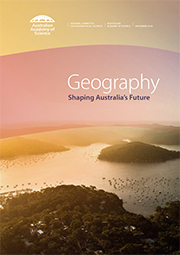 It provides a unified vision for Australian geography over the next decade. The plan offers a framework for engaging research, teaching and industry that aligns strategically with contemporary social, economic and environmental challenges of our region. The Australian Geography Competition is a contest for Australian secondary school students, assessing their geographical knowledge and skills. The Competition aims to encourage student interest in geography and to reward student excellence. >> To find out more and enter your students, visit the competition website and follow on Facebook. Congratulations to the four young Australian geography students who represented Australia at the XV International Geography Olympiad (iGeo) held in Quebec City, Canada, from July 31 to August 6. The Olympiad was organised under the auspices of the International Geographical Union (IGU) with the support of Université Laval, North America’s second oldest university. The four-member Australian team were selected through their outstanding performance in last year’s Australian Geography Competition (AGC) and Geography’s Big Week Out (from left to right): Phoebe Blaxill from St Mary's Anglican Girls' School, WA – bronze medal; Harry Hall from Trinity College (Gawler), SA; Hannah Wright from Walford Anglican School for Girls, SA – bronze medal, and Sophie Ohlin from Sydney Girls High School, NSW. The Australian team was accompanied by two team leaders: Kath Berg, Australian Geography Competition Committee and Liam Sloan, Geography Teachers Association of South Australia. Forty-three countries took part in this highly prestigious one-week international competition with the Romanian team declared the overall winners at this year’s event. To test the best young geographers in the world, the iGeo programme involves three academic challenges over the course of a week: a written response test, a multimedia test and a fieldwork exercise requiring observation, cartographic representation and geographical analysis. The programme also included poster presentations by teams, a cultural session showcasing Canadian cultures, and visits to Old Quebec (a UNESCO World Heritage site) and Forêt Montmorency. The value of the iGeo experience cannot be underestimated; participating students appreciate not only the opportunity to travel abroad and challenge themselves, but also the experience of meeting and making friends with passionate geography students from all over the world. "The iGeo was a fantastic opportunity not only to learn about geography, hearing from bright minds in the field and undergoing insightful fieldwork, but also to make friends from all around the globe. Being around such a wide variety of international cultures, personalities and languages is a rare event, and because of it the experience was invaluable." said Harry Hall, participating student. Kath Berg, Australian Team Leader commented that “The iGeo is a prestigious international contest. It inspires active interest in geographical studies among students and contributes to greater intercultural understanding through the friendships developed between students from different countries.” The Australian team has once again scored commendable results. This highlights the strength of Australia's Year 11 and 12 geography curricula in teaching students to think, analyse and interpret information. The role of geography in schools is continuously supported by the Australian Geography Competition. The pre-selection for the four-student team that will represent Australia at the 2019 iGeo in Hong Kong, China, is under way. Sixteen high-achieving Year 11 students from the 2018 Australian Geography Competition will soon be selected to take part in Geography’s Big Week Out, a six-day training/selection event, to be held on Kangaroo Island, South Australia in early October this year. 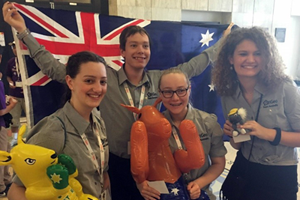 The participation of the Australian team at the International Geography Olympiad is made possible with the support of the Australian Government Department of Education and Training, Australian Geography Competition and with sponsorship of the AGC from Monash University (School of Earth, Atmosphere and Environment and School of Social Sciences), Macquarie University (Department of Geography and Planning and Department of Environmental Sciences), and The University of Queensland (School of Earth and Environmental Sciences). The annual Australian Geography Competition is a joint initiative of the Royal Geographical Society of Queensland (www.rgsq.org.au) and the Australian Geography Teachers’ Association. 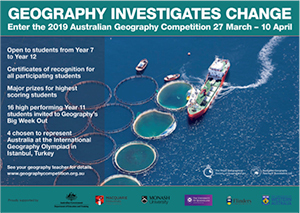 For further information about the Australian Geography Competition and its associated events, iGeo and GBWO, visit http://www.geographycompetition.org.au/. GeogSpace online resources with Education Services Australia (ESA) to support the implementation of the new geography curriculum. AGTA considers that both of these developments are critical for the future growth of geography in our schools and certainly warrants the energy and financial commitment AGTA has made to the process. The curriculum has reached the final stages of writing, consultation and validation and is due for release in 2013. Whilst this work has created an increased workload and investment from AGTA and its officers we continue to put together the 'National Geography Jigsaw' to promote geographical education in Australia. The world of geography in Australian schools continues to be a dynamic and exciting one for teachers and students. AGTA's capacity to deliver continues to be tested by the challenges of promoting the 'brand' of geography in the new National Education Agenda and putting together the jigsaw for the implementation of a National Curriculum for Geography. AGTA continues to meet these challenges with confidence and continues to be seen by others in the education community as an association of high standards and professionalism. Such a reputation is only possible through the support and hard work of all Directors on the AGTA Board and teacher members of affiliates. Effective feedback practice is shown to increase student progress by as much as an extra eight months over a year. AITSL in partnership with Evidence for Learning have developed new materials to support teachers and school leaders to enhance feedback practices with students in their context. A spotlight research summary – Reframing feedback to improve teaching and learning – to describe the underpinning research on effective feedback. Written and video case studies that profile effective implementation of feedback within Australian schools. Implementation resources, such as a readiness check, planning overview and an introductory presentation, to help schools introduce an effective feedback strategy. "We need to give young people the opportunity to form images of the world, of the interactions between people and places that are accurate, realistic and empowering. The next generation will make their own world. We need to give them the power to do it well. Having a substantial and really engaging geography experience as part of schooling is absolutely essential if this is going to happen." CARE Australia has developed a website which provides teachers with resources on a range of issues related to poverty and inequality. Topics include global poverty, education, health, women's empowerment, water and hygiene, food and nutrition, climate change and responding to emergencies. Each topic includes teaching tools such as fast facts, videos, and stories designed to spark curiosity and enhance classroom discussion. Copyright © 2010 Australian Geography Teachers Association (AGTA). All Rights Reserved.